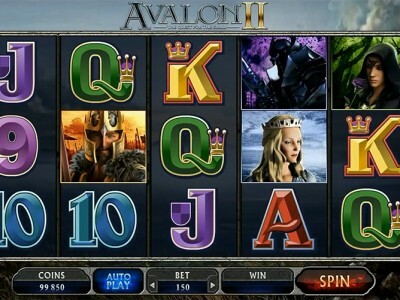 Avalon II is the sequel to the most popular original online pokies game Avalon. The game is themed on King Arthur and features Arthur, Merlin, Guinevere, Morgan and The Lady of the Lake as symbols. There are 243 Ways to Win along with two wild symbols, Merlin feature, a scatter symbol, and the Grail Bonus Quest. You can now experience the legend like never before. The Avalon II logo acts as the first wild and rises up on your pokies reels from the still waters of Avalon Lake. This substitutes for all others and you will be familiar with wild symbols from traditional Australian pokie machines. The Lady of the Lake is the second wild however it acts as an Expanding Wild. Therefore whenever it lands on reel 3, she will rise up to cover the entire reel and provide a much better scope for big wins as she too substitutes all other symbols. At random Merlin the Wizard can appear using his magical powers to provide an instant cash prize. I instantly won $50 on a $2 bet during this feature. The best road to massive payouts is through the The Holy Grail which is a sacred silver chalice acting as the scatter symbol. Hit three or more Holy Grail symbols and you get access to the Holy Grail Bonus Quest. The Holy Grail Bonus Quest begins in Camelot and leads to Avalon. Each station has special benefits, so the more you play the more rewarding your journey becomes. At the Lake of Legend, you aim to restore the Excalibur. The more you restore the bigger your win. At the Misty Vale, you get 15 free spins with an extra character wild. In the Whispering Woods, the White Knight provides 5 shields and you can pick one for an instant cash reward. At Forest Falls, you get 20 free spins with Trailing Wilds. On the Dusky Moors, you need to match two of the same helms to win a prize. At Morgan’s Keep, you get 20 free spins with Rolling Reels. In the Hall of Shadows, you engage in battle against the Black Knight to claim the grail. The Isle of Avalon is the ultimate destination allowing you to spin the wheels of Avalon to win a cash prize. Overall Avalon II is one of the greatest adventure game pokies available to play online.